Designed to handle washing industrial equipment or parts and can supply from one to six pressure washers. Wash Water Recycle Systems employ a biological remediation process. This term refers to the use of biological agents, such as bacteria or plants, to remove or neutralize contaminants, as in polluted soil or water. Users of this equipment will need to replenish the colonies of microbes. Equipment rental yards, automotive recyclers, military fleet operations, fork lift dealerships, trucking, marinas, food processing plants, municipalities ,warehouses, and oil field services to name a few. Biological Media: 1,152 sq ft for 750 Model; 2,679 sq ft for 850 Model. Biological Remediation process with 54 SCFM regenerated aeration. Please call for pricing on microbe replenishment pack. Ships UPS 2nd Day Air for preservation of colonies. With a talented service team that is second to none, Ultimate Washer can arrange the installation and service of your wash water recycling systems to maximize the operation and performance. Installation, Start Up and Training is necessary. Each system comes with an integral solids settling chamber at the beginning of the system. The coned-bottom settling chamber allows time for the heavy particles to settle out simplifying maintenance. A 2-inch valve is provided to periodically remove the collected solids. 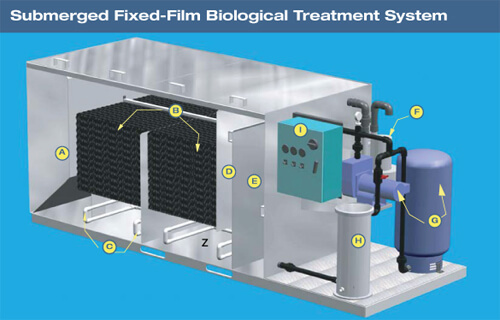 The bio reactors are equipped with over under weirs and bio-media that ensure maximum contact time with the microbes. The submerged, fixed film bio-media creates a large amount of surface area for the microbes to cling. Once the microbes are attached to the media, they can handle swings in contaminant loading, pH, temperature and other factors that limit the application of biological treatment systems. Microbes are continuously added to the system to ensure proper counts for the particular waste stream. The bio reactors are continuously fed with oxygen rich air through the aerators. The microbes require oxygen in order to consume the organic contaminants. The aerators are designed not to clog and to produce an air bubble that will allow for maximum oxygen transfer. The biologically treated wastewater has to travel through the integral clarifier. The clarifier collects the floc particles created during the biological degradation process. These floc particles are then used as a food source for the microbes during low contaminant loading times. The final step in the biological treatment process is the clean water well. The clean water well stores the treated wastewater for re-use or discharge. The blower operates continuously to provide oxygen to the microbes in the bio reactor. The blower requires no maintenance and can run continuously for up to 20,000 hours. In the recycling systems the treated wastewater is pressurized to up to 70 psi for re-use. A cartridge filter is provided to remove particles down to as low as 1 micron. The cartridge filters are made of a poly screen that can be easily washed out for long life expectancy. The control panel is UL listed. All functions of the treatment system can be controlled from this panel. The system is designed to be totally automated. Only during routine maintenance should any of the controls need to be adjusted.